The study of the physical features (external structure) of plants is referred to as morphology. Morphology of grass plants is not just a biological pursuit but can aid in many everyday decisions for the forage manager. Grasses, whether annual or perennial, are mostly herbaceous (not woody), monocotyledon plants with jointed stems and sheathed leaves. They are usually upright, cylindrical, with alternating leaves, anchored to the soil by roots. Grasses have leaves (blades that narrow into a sheath), a stem (culm), a collar region (where leaves attach to the stem), roots, tillers, and during the reproductive stage an inflorescence or seedhead develops. Grasses may have rhizomes or stolons and the collar regions have differing variations of ligules, auricles, and blades (laminas). Inflorescences of grasses also vary widely so during vegetative stages, the collar and leaves help in proper identification and during reproductive stages the inflorescence is very helpful. Inflorescences are an arrangement of many spikelets composed of individual florets. Grasses have three main inflorescence (seedhead) types: panicle, spike, and raceme. From a seed, primary (seminal) roots develop to nourish and anchor the seedling. Eventually fibrous or adventitious roots develop from lower stem nodes. Some grasses have underground stems called rhizomes which grow horizontally before pushing above ground to a new shoot. Some grasses have stolons which are above ground, trailing stems that produce leaves, roots, and flowering shoots from the nodes. Some grasses have both while some have neither. Stems or culms are really a series of sections called internodes which are separated by nodes. This is why grasses are referred to as jointed or as "joints" (during the proliferation of marijuana). The internodes or sections are very close together near the stem and but lengthen or stretch out as the plant matures. The internodes are most often hollow but a few grasses have internodes of white pith, such as sorghum. The branching of leaves always occurs at the nodes and develops from a bud that is between the leaf-sheath and the stem. When branching results from nodes at the base of the plant it is called tillering (suckering, stooling). All grasses have a distinctive collar region. Proper identification requires a look at this area where the leaf blade wraps around the stem. If the leaf blade is pulled back, the collar region reveals a unique combination of ligule, auricle, and meristemat tissue. Barnyardgrass has no ligule or auricles. But other grasses will have a ligule (hairy or membraneous growth at the blade-sheath junction). Ligules vary in size, shape, and type. Many grasses will also have distinctive auricles (appendages that wrap the blade around the stem). The meristematic tissue will appear whitish and is the area of leaf blade growth and expansion. When learning about grasses, it is helpful to learn how certain physical characteristics can affect other features. For example: meadow foxtail can be described as a cool-season, pasture grass. But its physical trait of having few leaves means it would not make a great hay and even as pasture, protein content may be a concern. Corn is a common warm-season grass but it is too tall for a pasture. How high a grass can grow or other unpalatable features will enter into forage-livestock decisions. 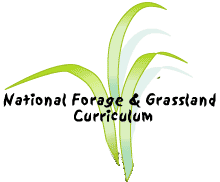 Whether a grass is an annual or perennial will determine many forage-related decisions. Annual species usually have inflorescences on more stems. Annual species typically require annual re-establishment costs and labor. This also may lead to erosion hazards. Most annuals grow during the spring and summer but some grasses are winter annuals and when used carefully can add flexibility to a grazing system. Wheat, annual ryegrass, and barley can extend the grazing seasons and reduce winter feed costs. Perennials have inflorescences on some stems but also produce vegetative tufts which will wait for two years or more to produce an inflorescence. Perennials reduce the yearly cost and labor or reseeding but must be managed to thrive or may not be as productive. Each grass has its own list of environmental characteristics as well. The following traits should be considered by forage managers: winter hardiness, drought tolerance, salinity tolerance, soil pH tolerance, production potential, and livestock suitability. Different grasses have different palatability, digestibility, and sometimes harmful effects on certain livestock. Livestock do have preferences and will be choosy, so careful management is necessary to ensure the best animal nutrition and pasture longevity and yield. Understanding grass formation and structure can help managers wisely use the vast variety of grasses available.